Police believe the man photographed in the blue shirt stole money from a woman's purse at a Burlington Coat Factory store. 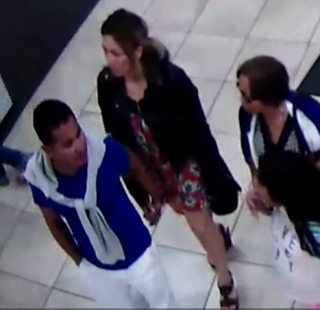 Police are asking for the public's help to find a man who allegedly stole nearly $1,000 in cash from a woman's purse as she shopped at a Gilroy department store Saturday. The suspect allegedly walked into the Burlington Coat Factory at 6900 Chestnut St. with his family, according to police. Once inside, the man ventured off and removed a woman's purse from a shopping cart, as the victim stood only a few feet away. The suspect then walked away and allegedly took $980 in cash out of the purse. Afterward, the suspect handed the purse to the store's cashier, claiming he had found it. The store's surveillance camera was able to capture images of the suspect. Anyone with information about his identity is asked to contact Gilroy police at (408) 846-0347.